Yep! 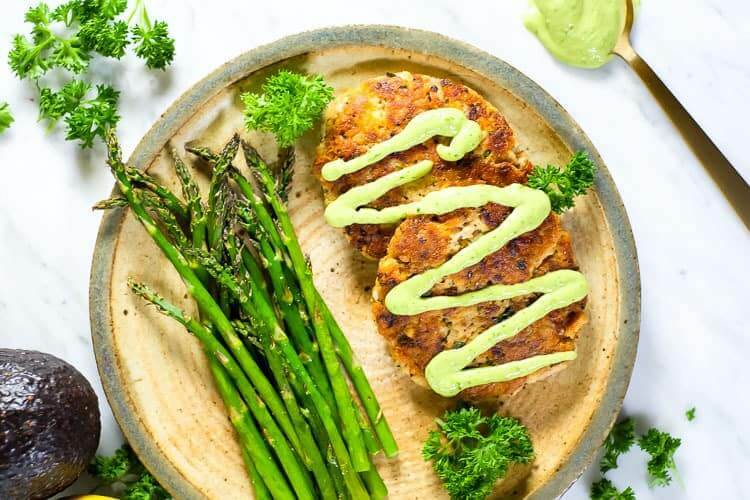 We went and said it – these are the best salmon patties! And the magic green sauce is like the cherry on top! 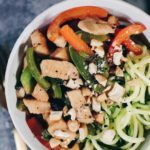 It’s such a tasty combo and super easy to make (I mean isn’t that kind of the best part?!). Delicious and easy pretty much always wins at our house. 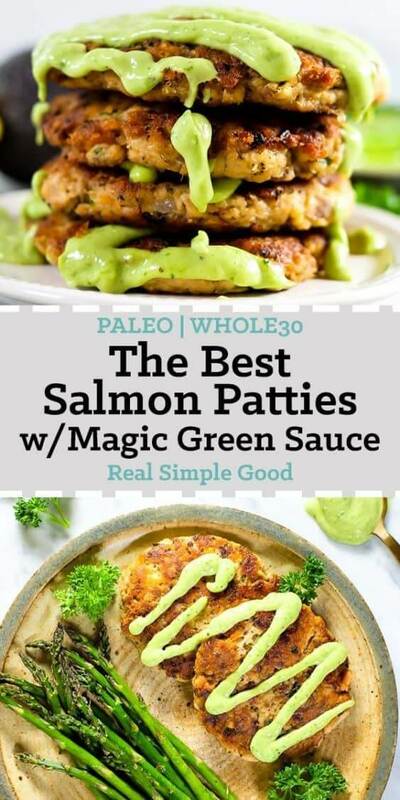 This recipe for the best salmon patties is both Paleo and Whole30 compliant, and honestly you can probably sneak them past your kids and husbands as just another delicious meal! Let’s just get it over with in case you’re wondering. What makes these the best salmon patties, you might ask? Well, really it’s all the goodies that get combined with the salmon that make them super tasty (fresh herbs, shallot, garlic, lemon, etc.) and then pan frying them on the stove to get the crispy outer layer really gives them an amazing texture! 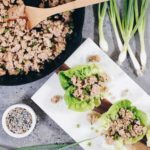 Add the magic green sauce on top, and you’ve got a delightful combo of savory, creamy and refreshing flavors. 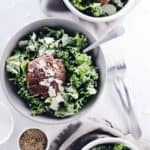 You might just start making this green sauce to put on all your bowls and salads! It’s super tasty and has a delicious creamy texture from the avocado. The lemon juice and parsley add a refreshing and bright flavor. And the best part….it’s SUPER easy to make! Just throw all the sauce ingredients in a blender and mix it up! Do yourself a favor and find a canned wild salmon that is not only high quality (canned with no preservatives, oils, etc.) but is also skin and bone-free. We like the brand Safe Catch because their products are all ethically sourced, low in mercury and minimally processed. They are also the only brand that tests every single fish for mercury. Impressive, right?! You can learn more about Safe Catch products here. 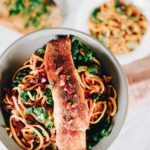 Their canned salmon makes throwing this recipe together a breeze! You just add all of the patty ingredients into a bowl, combine them and form patties. 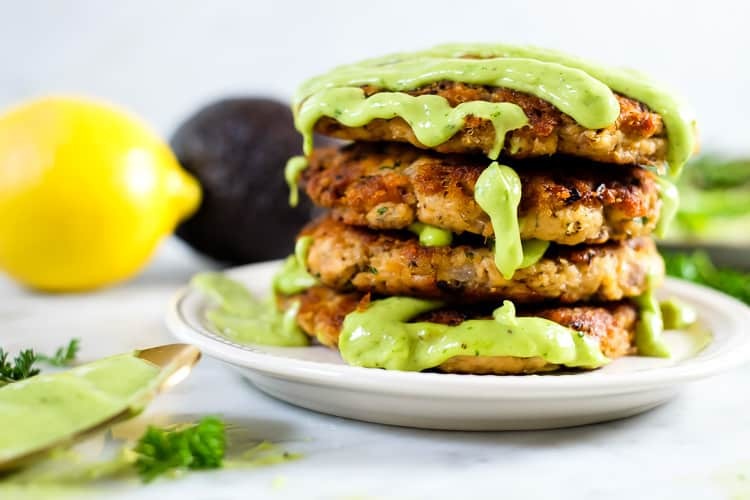 You’ll be enjoying the best salmon patties in no time! 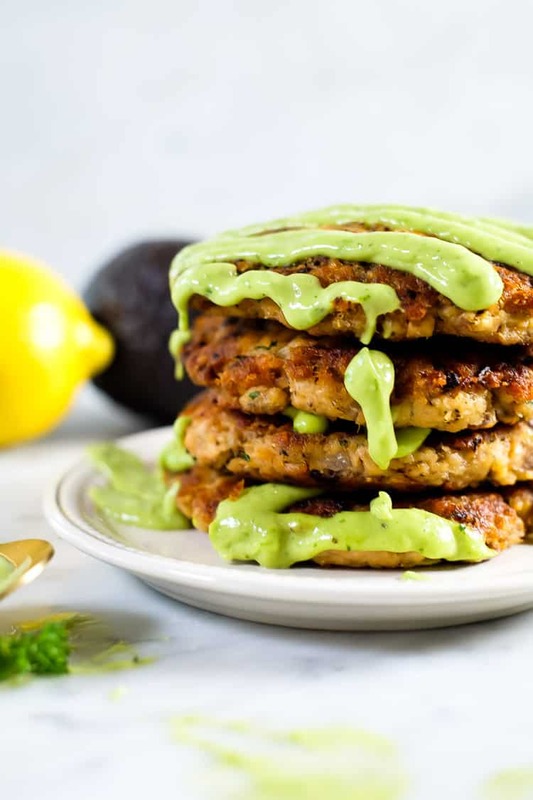 Go ahead and pick up some Safe Catch canned salmon, and make the best salmon patties! 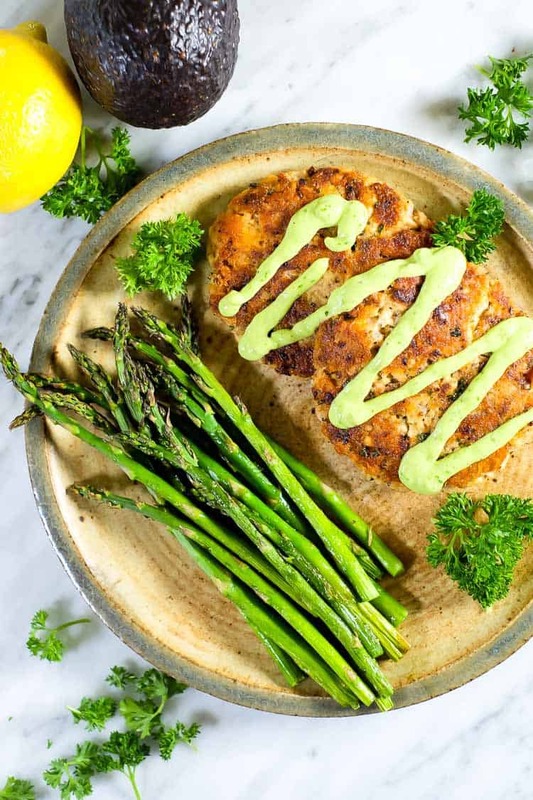 You’ll love the refreshing and creamy magic green sauce, too! Let us know how it goes by leaving a comment below. Also, take a photo and tag us on Instagram @realsimplegood, so we can check it out! Do you follow us on Instagram yet? If not, be sure to give us a follow! Yep! 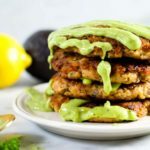 We went and said it - these are the best salmon patties! And the magic green sauce is like the cherry on top! 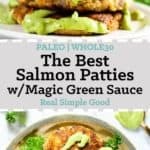 This recipe for the best salmon patties is both Paleo and Whole30 compliant, and honestly you can probably sneak them past your kids and husbands as just another delicious meal! To prepare the sauce, place all sauce ingredients in a food processor and pulse until smooth. Add more water if desired depending on the consistency you want. Taste and season with additional salt and pepper, as desired. Set aside. For the salmon cakes, chop shallot, garlic and parsley as noted. Add all of the ingredients for the salmon cakes through the pepper to a medium size bowl. Mash everything together with a large fork or your hands. Form the salmon mixture into 4 patties. Heat a large skillet over medium heat and add 1 tbsp avocado oil. Once the skillet is hot, place the salmon cakes in the skillet to cook. Cook, without disturbing, for 3-4 minutes on each side, until golden brown on the outside. Drizzle some of the sauce over the salmon patties and enjoy. Can you freeze the salmon patties? We haven’t frozen them before so we can’t say for sure. However, they would probably be fine frozen. I’d recommend making the patties just up to the cooking step and freezing them. Then you’d just have to thaw them completely and cook as noted in the recipe. Let us know how it goes if you try it! These look so great! I love a good salmon/fish patty. 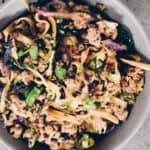 They’re super easy and make for a great quick lunch. How long does the green sauce last, in the refrigerator? 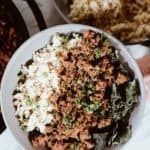 How much green sauce is made with this recipe? It will definitely last a few days, probably up to 4-5 days max. You’ll have some leftovers but how much depends on how much sauce you like to put on your patties. We tend to be a little sauce heavy, so we only had a little leftover. Hope that helps and hope you give it a try! 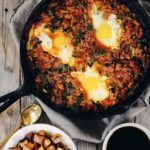 I’m looking forward to making these for brunch this weekend! 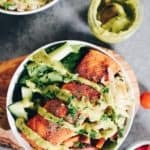 What are your thoughts on using fresh salmon versus canned for this recipe? We haven’t done this, but if you use fresh salmon you’ll have to cook it in advance. 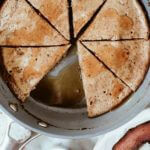 You’ll need it in small, flaky chunks in order to be able to form it into patties. Just roast the salmon at 400°F for 15-20 minutes, let is cool and flake it with a fork. That should give you a similar texture to canned salmon. Let us know how it goes if you try it! I’m surprised with all the positive comments. Mine fell apart because the recipe omits a binding agent – egg??? Sorry to hear that yours fell apart. You have to pack them tightly with your hands and flip them carefully and they turn out as pictured. This sauce is magic!! My patties fell apart a bit but were delicious. I won’t if an egg would help. I’m putting this sauce on everything! They are tasty but they fell apart. They can vary a little with the different kinds of canned salmon. You could also try adding an egg to help them bind better! Hope you’ll try them again! I added an egg to hold the mixture together. Very tasty!